Two Wheels and Other Things » Blog Archive » Follow up…. Chalk up another win for ByrneInvent. Greg K grabs a first place. F#@$’n rock on. We are on fire this year. Congrats to Greg, Dustin and Tony. Sorry I couldn’t be there to help guys. Let’s rock it all next week in Bellingham. 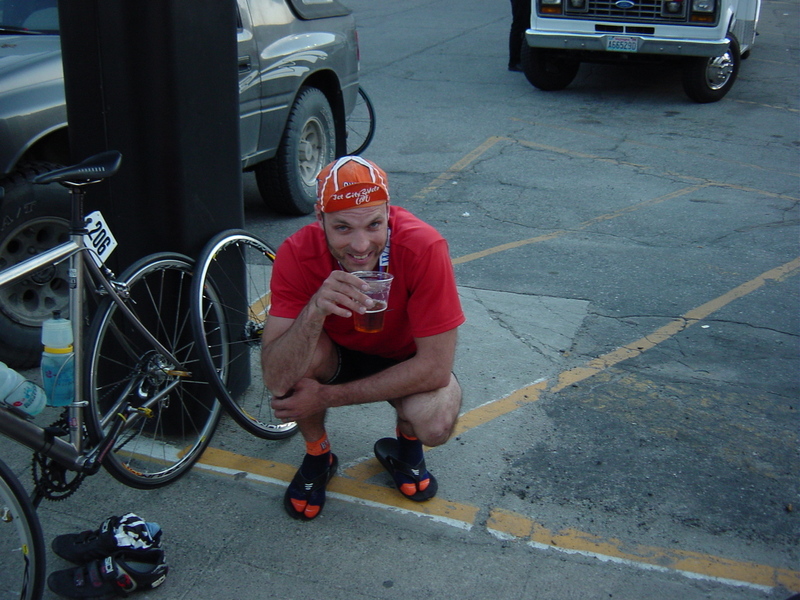 Greg K, goofy grin, hairy legs and a beer. What else do you need? Naw… let us race together as 3’s for a while. :-) Dustin and Greg can upgrade at the end of the season! “40 points in 12-months is an automatic upgrade.” Make sure he works for you and doesn’t get all the points for himself! I think Jeff Casey from Wines is even more over the point limit. now THERE is a guy who needs to upgrade. When Geoff flew past me at Ravensdale I knew he was going to win it. He’s on a whole different level right now. I’m upgrading this week, lest I be deemed a sandbagger. BTW, Boston Harbor only counted for 5 points because it had less than 50 people…so that puts me at 37. Sandbagger? Naw. Just great form at the end of last season and the beginning of this one. I’m just a blog reader. Why work when you can read about cycling. I love the socks and flip flops. Nice!